Now, I’ve been living in Germany for over a decade. It would be impossible to write a vegan cookbook of recipes based on travels and life abroad without a tribute to mushrooms collected in the forest. Just about every German I know can tell nostalgic stories of combing the woods for wild mushrooms as a child. I have learned a lot from watching others. But I still don’t collect mushrooms relying on my own knowledge of the funny things. Besides, it’s so much more fun running around the woods with other adults and kids. Other friends in Berlin have invited me for risotto dinners, and as usual, I always hang out in the kitchen to help… and spy, of course. There’s always so much to learn. Especially from others who’ve also lived abroad for work or studies and have their own exported cooking secrets to share! Chop, soak sun-dried tomatoes with 2-3 Tbs warm water in small bowl. Rinse, chop rosemary, thyme, sage. Heat 1 Tbs oil in a large sauce pan on medium high heat. Add mushrooms, drizzle lightly with olive oil, mix well. Add pepper, rosemary, thyme, sage. Add sun-dried tomatoes + soaking water. Sauté, stirring regularly about 5-7 min. When mushrooms are nearly cooked (and probably half the size) turn off and remove from heat. Cover. Heat margarine + 1 Tbs olive oil in a large pot on medium heat. Add garlic, shallots. Fry until lightly caramelized, stirring regularly, about 5 min. Add rice (dry). Mix well, coat with oil mix, lightly fry, 2-3 min. Add wine slowly, stirring constantly, cook until grains absorb most liquid, about 5 min. Add 2 cups broth (or 2 cups water + veg broth powder), stir slowly, near constantly, on medium low, 10 min. Add ground cashews, soy milk, nutmeg. Mix well, continue stirring frequently. Continue to simmer, stir, adding small amounts of broth/water as needed (another 1-2 cups, gradually) until rice is cooked, liquid is reduced / absorbed, desirable texture achieved, about 35-40 min total. When rice is done (test by taste or mash with fingers), turn heat to low, add mushroom-herb sauté, stir in gently, cook 1-2 min. Turn off heat, cover until ready to serve. Garnish with chopped chives, parsley, and ground black pepper. Dried spices may be used in place of fresh. Add a few threads of saffron for the last 15 min of simmering for an exotic touch. Add 1/2 tspn red chili flakes or 1 sliced red chili to herbs in mushroom sauté for a spicy bite. The mushrooms can be replaced with other chopped vegetables: cauliflower, asparagus, broccoli, to name a few. Adjust sauté time and water amount accordingly. Vegans addicted to nutritional yeast flakes and those obsessed with vitamin B12 are hereby allowed to add 1-2 Tbs nutritional yeast in the final cooking stages for an extra cheezy flavor boost. 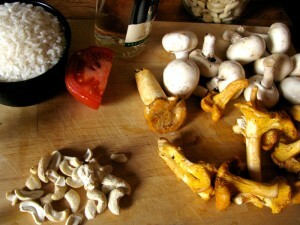 This entry was posted in Italian and tagged cashew, italian, mushroom, recipes, risotto, sundried tomato, vegan, wine. Bookmark the permalink. Spicy but sweet in a way! Thanks, Miss Crackpot! :) btw- like the photos on your site! That vegetarian sushi (just had to look up that place) and the pancakes look fantastic! A grand & stylish dinner. 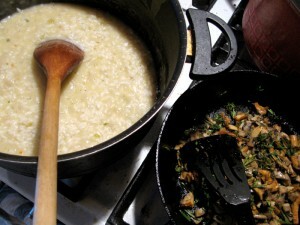 I adore a good home-made risotto. Yours looks extremely tasty! 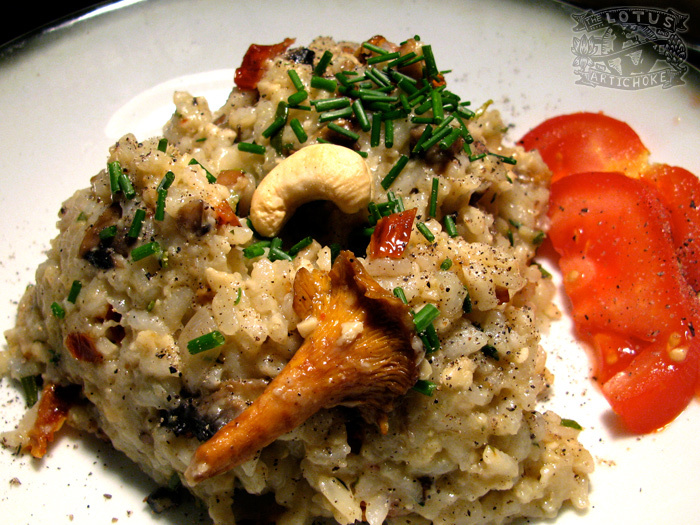 :) Real flavours & extra richness in this beautiful risotto! This is delicious! My husband just came back from NYC and said this tastes exactly like the risotto he had at a vegan restaurant there. Thanks, Jill… your comment reminds me I should make this again… soon! I just ate too much of this… Yum! This is the best risotto I’ve ever made. God bless the cashew, ya know? I subbed asparagus for mushrooms since my husband is not a fan (what?! ), and added saffron at the end. Thanks!! Asparagus! A great idea! Thanks for letting me know, Tara… glad you both enjoyed the risotto! I used soy creamer (plain flavor) 2/3 cup instead of soy milk and cashews. Turned out great!